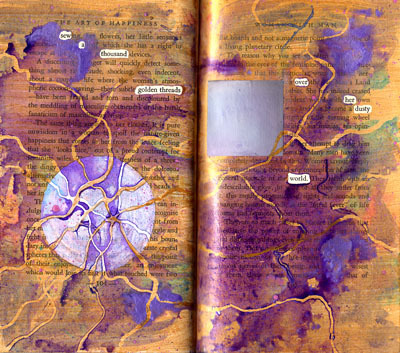 Altered Books, Book Arts, Poetry. permalink. I just stumbled upon your lovely blog tonight, while searching for some good images and ideas for jump starting a project at my group (Imagination Tribe). I love your photos and the fact that you give detailed information on technique. Awesome project. I also sympathize with you on the loss of your Mum. I lost my mother four years ago and I just miss her more than ever. Art is my sanity at times. :) Hugs. hi karen, it has been a few months since i jumped in on your page and i changed my email..i am now on your newsletter list..
Great Blog! Really enjoyed the last post, full of handy tips and interesting comments! What a lovely idea. I normally see books as just black and white and the infomation written, rather than something that can be used as a pice of art. Not sure i could do it though. I just stumbled upon your page you are so talented and have such beautiful work! I couldn’t find your email, but I would love to email back and forth and discuss ideas! I am finishing the last leg of my degree in art therapy and I work with children that have been abused. I would like to see if you could provide me with some new ideas 🙂 I’m looking forward to hearing back from you!